In That Line of Darkness Vol 1: The Shadow of Dracula and the Great War,Encompass Editions, 2011, Robert A. Douglas explores the tradition of Gothic novels, most notably Bram Stoker's Dracula, Robert Louis Stevenson's The Strange Case of Dr. Jekyll and Mr Hyde, and Oscar Wilde's The Picture of Dorian Gray, peering through the lens of these extraordinary works to see more clearly the class, race and gender tensions in late nineteenth-century Britain. Drawing upon Gothic conventions – the demonization of the other, the use of doubling and the uncanny, psychic vampirism and the compulsion for blood "purity" or national "purification" – Douglas draws connections between Dracula and Jack the Ripper, between Robert Baden-Powell and Oscar Wilde, and between Dracula and an electrifying piece of investigative journalism about underage girls lured into prostitution. That Line of Darkness is divided into four parts. The first three focus on the fin-de-siècle, culminating in Part Four, an illumination of the Great War and its aftermath through the prism of these Gothic conventions. Our understanding of war fantasies, national propaganda, the ghastly conditions in the trenches, the often barbaric treatment of emotionally damaged soldiers and the power of spiritualism is enriched as Douglas examines each through Gothic filters. That Line of Darkness has been praised as making a valuable contribution to historical insight into the furious emotions that were generated by peacetime controversies and the threads that connected them to the Great War. In That Line of Darkness Vol. 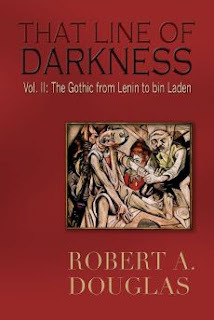 II: The Gothic from Lenin to bin Laden, Encompass Editions, 2013 Robert A. Douglas continues his exploration of the history of the twentieth and twenty-first centuries as seen through a Gothic lens. As he did in the first volume, Douglas deploys Gothic conventions – the uncanny, psychic vampirism, the demonization of the other, the double, the compulsion for racial purity and the power of the primitive past to threaten the modernist present – to illuminate the Soviet Union under Lenin and Stalin, Nazi Germany during the 1930s and modern America from the early Cold War to the war on terrorism. The first volume – The Shadow of Dracula and the Great War – was grounded in literature. This second volume is grounded in historical fact, though Joseph Conrad's The Heart of Darkness is a seminal text for Douglas' examination of America. In The Gothic from Lenin to bin Laden, the tropes are no longer those of vampires or the atavistic primitive embedded in the spirit of a respectable Victorian gentleman, but are drawn from the world of police states and even from open societies engaged in propaganda that has been frequently vampiric in substance, constructed to dehumanize the "other". The Gothic survives here, as Douglas shows, in the horror of interrogation chambers, mass executions and the "undead" of the camps – and the more recent and inhumane treatment of civilians.